Sullivan County is a rural county located in western New Hampshire and the second poorest of the state’s ten counties. The economy features higher-than-average employment in metal product, wood product, furniture and machinery manufacturing and lower than-average employment in health care services and professional, scientific and technical services. Unemployment is low (approximately 2.5%), but there are significant challenges with workforce development and demographics that jeopardize continued growth. Other challenges include the opioid crisis, and depressed property values. Goal #1: Discover and build consensus around our creative regional identity. 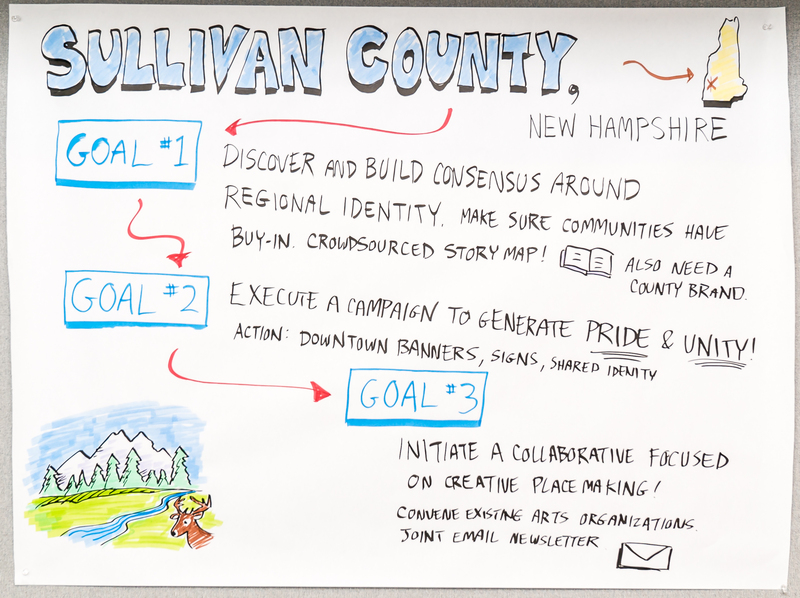 Create a crowd-sourced story map about what people "love" about Sullivan County. Create a county brand with a marketing package. Consider an asset mapping project. Goal #2: Execute a campaign to cultivate pride and unity around the cultural regional identity. Develop "downtown" banners and/or pop-up displays of photographs of things that are locally loved. Develop and erect signage saying "You are entering Sullivan County" at all entrances to the county. Encourage pop-up arts and culture events in many communities in Sullivan County. Goal #3: Initiate a collaborative focused on supporting creative placemaking around the county. Hold small convenings that help identify and support Goal #2: Action #3. Convene arts organizations throughout the county to start creating collaborative programming initiatives. Develop an "Arts in Sullivan County" monthly e-mail newsletter.